When serious flooding occurs, the catastrophic images of cars floating down the street dominate the local news cycle. Dramatic rains cause tens of millions of dollars in repair costs to homes and businesses. However, a simple, slow leak can also lead to substantial damage and reconstruction costs to your home. Waters weakens wood and corrodes metals. The most home construction relies on both materials along plus concrete. A compromised structure can also lead to buckling floors and collapsing walls and ceilings. Sheetrock walls are also vulnerable to slow water leaks. Again, the gypsum base, faced by paper, creates a sponge that pulls water deeper into the core of your home. The walls will not only become weak but also harbor mold. When water has long sustained contact with unsealed bricks or concrete, cracks and erosion can result. If the moisture freezes and unfreezes, the damage is exponential. Cracks in the foundation can lead to expensive and complicated repairs to the destabilized foundation. Water also weakens the backings of your carpets and rugs, making them more susceptible to wear and tear. Carpet is durable but not designed to stay damp; this invites rot, decay, and insects. Leaks can also cause damage to metal fixtures like sink taps and shower heads. Rubber gaskets decay and become debris in the line, reducing water pressure. In the bathroom, a slow leak may loosen tiles near the tub or shower. In your kitchen, damage may progress to warped or discolored floorboards near the dishwasher, sink, and refrigerator. Standing water attracts insects and insects bring germs (and more insects!) 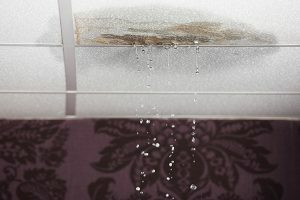 Once a moist environment develops inside your home, airborne mold spores can flourish. These colonies release mold spores into the air and can cause skin and respiratory irritations (as well as unpleasant odors). Any water damage will become an issue when you sell your home. Avoiding repairs in the present will create expenses in the future. For example, the home inspector will spot and document water damage not properly addressed. Potential buyers will make a ‘low ball’ offer for less money or worse, infer that the home too much trouble to take on. Get friendly, high-quality assistance from Total Restoration’s certified staff. These experts go through extensive water damage training and have years of experience under their belts. Armed with top-notch equipment and proven techniques, they will systematically repair and restore the damage resulting from a leak in your home. Total Restoration provides 24-hour emergency services to help commercial and residential property in Conroe. By working closely with you and your insurance company, claims can be settled quickly so that repairs can begin. Call today for help recovering from any residual water damage. We only service the State of Texas. Total Restoration provides fast, emergency response throughout Southeast Texas to help commercial and residential property owners recover from damage to their property caused by natural disaster, fire and water. © 2017 Total Restoration. All Rights Reserved. If you have an emergency, call us 24/7 for fast, emergency response!